EC Motor Controls Details — Evolution Controls Inc.
Increase/decrease control for EC Motors. Status and Flow Index Lamps. Allows VAV controls to control motor instead of a damper. Allows 24 Vac controls to select one of four adjustable flow indexes for an EC Motor. Fast or Gradual Speed Change. Adjustment range is from Off to 100% of the programmed control range. A fifth adjustment sets the flow index when no tap is selected. Allows industry standard 0-10V controllers to adjust and monitor the EC Motor. 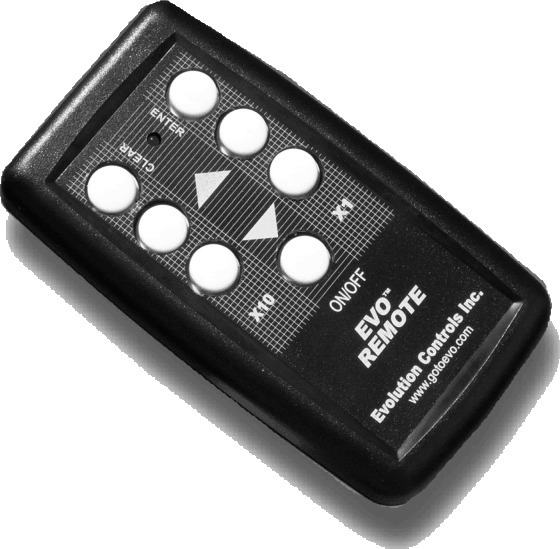 Allows remote adjustment of output from 0 to 100% of programmed control range. Fan flow can be factory set using manual adjust and heating can be tested without connecting a 1-10V supply. Lamp indicators reference flow index. During construction, heat can be used before automation is installed. Air balance can be achieved before automation is installed. The EVO/ECM-DPC controls an EC Motor powered fan to maintain an adjustable static or differential air pressure. Set the air pressure setpoint to the desired pressure. Then proportional & integral control technology modulates the fan to maintain setpoint. Applications: Rooftop Exhaust, Cleanrooms, Ventilation Systems, Modulating Diffuser Systems, Restaurants. The display shows pressure during operation. When adjust is turned, the display shows the setpoint. The display backlight uses color to indicate control loop status. When a system disturbance or change in setpoint occurs, the backlight changes from green to yellow or red. Alarms: If the system fails to maintain setpoint, the display remains red. 0-10 Volt automation interface with low RPM, electric heat cutout. Signal controls motor on/off and output (air volume). Eliminates troublesome pressure and paddle switches. The heater only works when the motor is in the correct RPM (speed) range. Heat cutout on high and low RPM. Allows a service technician to field select the output of EC Motors. Allows simple and economical selection of one of four pre-programmed flows. The motor is programmed by the equipment manufacturer to provide the desired flow for each tap. The output is simply selected by moving the selector wire from one tap to another. Boards may be ganged for more selections. The EVO/ECM-MDR16 motor driver allows manual adjust, or industry standard 0-10V automation signals to control up to 16 EC Motors. Allows accurate manual adjustment and monitor of fans for up to 16 motors. Provides local or remote adjustment of the EC Motor output from 1% to 100%. A signal lamp on the control continuously flashes out the flow index. Instruments are not required to read the flow index (%). May also be used for stand-alone manual controls. The EVO/ECM-SNV allows industry standard 0V to +10V automation signals to adjust PWM controlled EC Motors. The device is designed and packaged to provide a solution for rooftop machinery and other severe environment applications. The SNV provides remote adjustment of the motor output from 0% to 100% pwm of the motor’s programmed control range. A signal lamp continuously flashes out the percentage of pwm. Instruments are not required to read the output. The signal lamp also indicates the EVO/ECM-SNV is powered, the microcontroller is running and indicates the control signal in tenths of a Volt. The green lamp continuously indicates the %pwm motor control signal. Pilot Pulse (Autoswitch) provides a 49us pulse at a minimum and maximum signal so the motor knows the EVO/ECM-SNV is connected. Pilot pulse detection switches the motor to be controlled by the pilot pulse capable controller for automation and other special applications. The EVO/ECM-MXC2 connects one EVO/ECM-Control to 2 motors. The master control sets the speed of both motors. A second control may be connected to monitor the 2nd motor RPM. Four-digit LED display alternates between flow index and RPM. Easy to adjust, especially in dark spaces. Allows accurate manual adjustment and monitor of fans. Features a 4-digit LED display to allow easy reading in dark spaces. Flow index can be set with the screwdriver adjust. Four display modes for flow indexes and motor RPMs. May also be used where automation systems only turn the fan on or off. Allows an industrial or building automation system to monitor and control four EC motors over an industry-standard ModBus RTU serial data link. Each EVO/ECM-MODBUS interface connects up to four EC motors. Pilot Pulse (Autoswitch) provides a 49us pulse at a minimum and maximum signal so the motor knows the EVO/ECM-MSpd is connected. The EVO/ECM-TAPx4 is a 4-line, diode multiplexed function select board that may be used to allow field selection of motor speed for up to four thermostat or automation controls lines. Compatible with Regal Beloit's Genteq™ 2.3 and Eon™ motors. Compatible with other devices that use diode multiplexing to select speed taps. Features 4 tap lines selected by a thermostat or other 24Vac signal source. For residential and commercial applications requiring field selection of motor output. Allow a 0- +10V signal to step control a Regal Beloit X13 or Endura Pro ECM motor. Available for use with all EC Control Units. Each cable comes with plenum rated cable material in custom lengths to fit your needs, a connector on one end that hooks directly into the EC Motor, and a connector on the other end that hooks to the EC Control Unit. Each cable comes in lengths to fit your needs, a connector on one end that hooks directly into the ECM Motor (red jumper wire may be clipped out for 220V operation), and bare stripped wires on the other end to be hooked into power.